N.B. : Washington Times title: "Reasons to smile in Israel"
In a typically maladroit statement, U.S. Secretary of State John F. Kerry recently complained that Israelis are too contented to end their conflict with the Palestinians: "People in Israel aren't waking up every day and wondering if tomorrow there will be peace because there is a sense of security and a sense of accomplishment and of prosperity." While Mr. Kerry misunderstands Israelis (Palestinian rejectionism, not prosperity, caused them to give up on diplomacy), he is right that Israelis have a "sense of security and … of prosperity." They are generally a happy lot. A recent poll found 93 percent of Jewish Israelis proud of be Israeli. Yes, Iranian nuclear weapons loom and confrontation with Moscow is possible, but things have never been so good. With thanks to Efraim Inbar of Bar-Ilan University for some of the following information. Let us count the ways. -- Women need to give birth to 2.1 children to sustain a country's population; Israel has a birthrate of 2.65, making it the only advanced country to exceed replacement. (The next highest is France at 2.08; the lowest is Singapore at 0.79.) While Haredis and Arabs account for some of this robust rate, secular Jews are the key. -- Israel enjoyed a 14.5 percent growth of gross domestic product during the 2008-12 recession, giving it the highest economic growth rate of any OECD country. (In contrast, the advanced economies as a whole had a 2.3 percent growth rate, with the United States weighing in at 2.9 percent and the Euro zone at minus 0.4 percent.) Israel invests 4.5 percent of GDP in research & development, the highest percentage of any country. 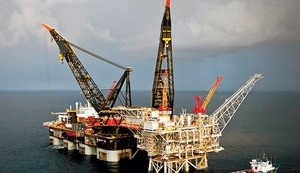 -- Due to major gas and oil finds, Walter Russell Mead observes, "the Promised Land, from a natural resource point of view, could be ... inch for inch the most valuable and energy rich country anywhere in the world." These resources enhance Israel's position in the world. -- With Syria and Egypt consumed by internal problems, the existential threat they once posed to Israel has, for the moment, nearly disappeared. Thanks to innovative tactics, terror attacks have been nearly eliminated. The IDF has outstanding human resources and stands at the forefront of military technologies; and Israeli society has proven its readiness to fight a protracted conflict. Mr. Inbar, a strategist, concludes that "the power differential between Israel and its Arab neighbors is continuously growing." -- The Palestinian diplomatic focus that dominated the country's politics for decades after 1967 has receded, with only 10 percent of Jewish Israelis considering negotiations the top priority. Mr. Kerry may obsess over this issue but, in the acerbic words of one politico, "Debating the peace process to most Israelis is the equivalent of debating the color of the shirt you will wear when landing on Mars." -- Even the Iranian nuclear issue may be less dire than it appears. Between the vastly greater destructive power of Israel's nuclear arsenal and its growing missile defense system, military analyst Anthony Cordesman predicts that an exchange of nuclear weapons would leave Israel damaged badly but Iranian civilization destroyed. "Iranian recovery is not possible in the normal sense of the term." Maniacal as the Iranian leadership is, will it really risk all? -- Successes of the "boycott, divestment, and sanctions" movement are pretty meager (Stephen Hawking snubbed the president's invitation! A United Nations body passed another absurd condemnation). Israel has diplomatic relations with 156 out of the United Nations' 193 members. Looking at multiple indices, Mr. Inbar finds that, globally, "Israel is rather well integrated." -- In public opinion surveys in the United States, the world's most important country and Israel's main ally, Israel regularly beats the Palestinians by a 4-to-1 ratio. And while universities are indeed hostile, I ask handwringers this question: Where would you rather be strong, the U.S. Congress or the campuses? To ask that question is to answer it. -- Ashkenazi-Sephardi tensions have diminished over time due to a combination of intermarriage and cultural cross-pollination. The issue of Haredi nonparticipation is finally being addressed. -- Israelis have made impressive cultural contributions, especially to classical music, leading one critic, David Goldman, to call Israel a "pocket superpower in the arts." The Israel Philharmonic Orchestra, founded in 1936 is a leading cultural institution. Listen up, anti-Zionists and antisemites, Palestinians and Islamists, extreme right- and left-wingers: You are fighting a losing battle; the Jewish state is prevailing. As Mr. Inbar rightly concludes, "Time seems to be on Israel's side." Give up and find some other country to torment. 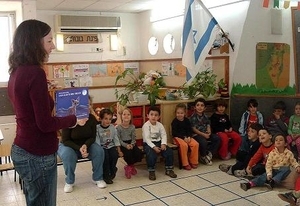 *This picture shows Miri Leshem-Pelly, an Israeli naturalist and children's book author-illustrator, reading her book Lon-Lon's Big Night to a class. Published with an English and Hebrew text, the book introduces children to Negev fauna. June 5, 2013 addendum: For more information about Israel along these lines (for example, its unique record at recycling water), see my blog "Remarkable Israel." June 10, 2013 update: For an opposite take on Israel's future, Leon Wieseltier has just announced that "Unless there is a solution to the Israeli-Palestinian conflict, there will not be a Jewish state for very long." June 16, 2013 update: For a survey of what might be titled "Unhappy Syria," See Paul Rivlin's article, "Syria's War of Self-Destruction and Its Regional Implications." After detailing the disastrous state of the country, he concludes that "the Syrian war has already become one of the worst disasters in modern Middle Eastern history."